Aquaculture is the world’s fastest-growing animal food producing sector, and in developing economies across the Pacific region, it provides a wide range of unique opportunities.1 Using data from the United Nations’ Food and Agriculture Organization, we’ll explain how aquaculture can have an impact in three important areas: food security, economic development, and sustainability. 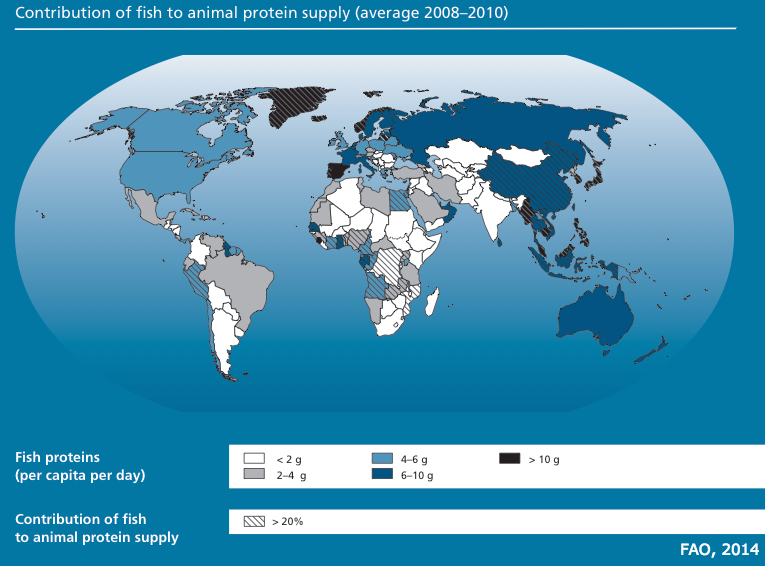 The availability of fish is crucial in these regions, where other sources of animal protein can be scarce. In Cambodia, for example, fish accounts for 65 percent of the average person’s animal protein intake, compared to only 17 percent globally.4 Fish is also an important source of micronutrients and omega-3 oils. 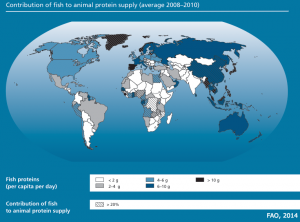 Countries in the Pacific-Indian Ocean region are among the top aquaculture producers in the world, accounting for nearly 90 percent of the world’s farmed food fish in 2012.5 Aquaculture is already an indispensable resource for food security here, and further innovations can help ensure that nutritious food reaches malnourished populations by increasing efficiency and improving sustainability. Aquaculture represents a rapidly growing share of global fish production, and with that increase comes a range of opportunities for economic growth in developing regions. 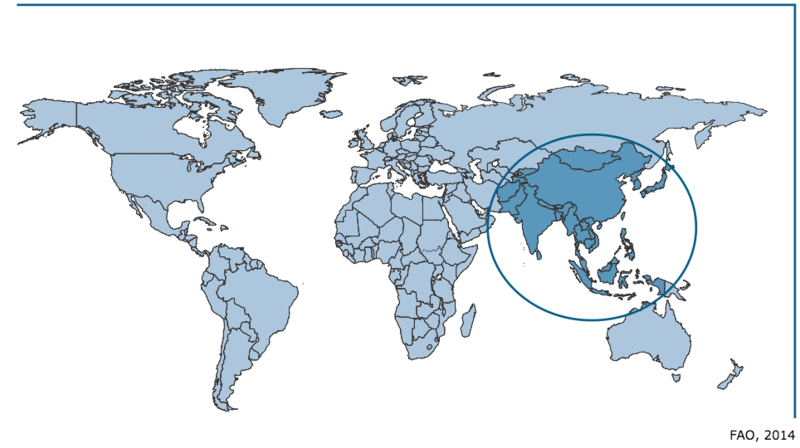 Nearly three-quarters of global aquaculture production may be contributed by small-to medium-scale fish farmers living in Asia, according to the UN High Level Panel of Experts on Food Security and Nutrition (HLPE).6 Secondary activities, like processing, provide further opportunities. In all, the FAO estimates that fisheries and aquaculture assure the livelihoods of 10–12 percent of the world’s population. 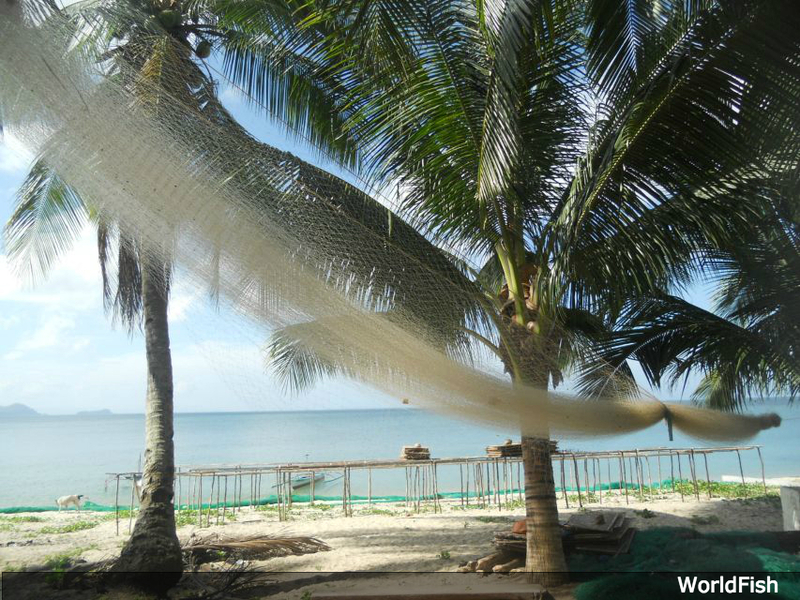 Furthermore, there remain a number of areas in which innovation can make aquaculture more efficient. For example, many aquaculture systems use low-value wild fish to feed farmed fish, resulting in poor feed conversion efficiency ratios. In grouper farming, for example, feed-to-output ratios can range from 7:1 to 15:1.10 That means that seven to 15 low-value wild fish are needed to feed each grouper. Scientists like CSIRO’s Cedric Simon are studying ways to make fish feeds that are sustainable, affordable, and nutritious. Another example is land use. Aquaculture ponds occupied an estimated 18 million hectares of land in 2014, mostly in Asia. The World Research Institute estimates that, in order to meet growing demand for aquaculture products by 2050, an additional 24 hectares of land would have to be converted into ponds.11 In all, the total area would be roughly the size of the United Kingdom. In order to avoid converting such a huge amount of land for aquaculture use, we need aquaculture systems that use space more efficiently. The Blue Economy Challenge is a call for innovative solutions that will help break down the barriers to truly sustainable aquaculture. The three challenges each address a different area where innovation is needed: rethinking feed for aquaculture, designing new ocean products, and creating sustainable systems. Learn more about how you can develop and submit your project idea here.